WILLEMSTAD – The Parliament of Curaçao will continue its meeting tomorrow on the upcoming elections. The Prime Minister is back on the island and the new majority wants to debate with him about the reason why he dissolved parliament and called for early elections. 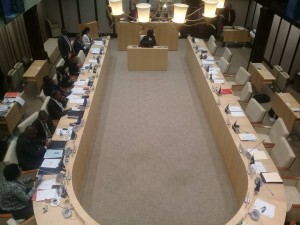 This topic was already on the agenda last week but the meeting was canceled after the incident between MPs Jacintha Constancia and Giselle McWilliam.